The Kaliningrad Region, formerly part of East Prussia, is bound at the Baltic Sea by two thin sand strips called the Curonian and Baltic spits; they look similar to a lobster. As different as East and West, their beauty unfolds like a pair of sandy siblings. So, what is there to do here? 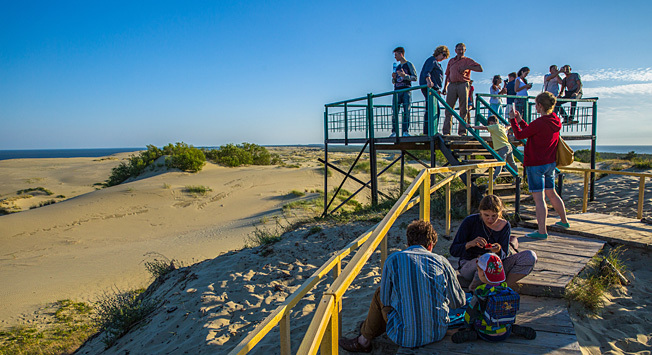 Why not catch your breath on the top of Efa on Curonian Spit, one of the highest moving sand dunes in Europe? Or perhaps you’d like to say hello to a “drunk” forest (that’s what locals call the “dancing” limbs of trees here), try delicious fresh smoked fish or check the seawater temperature in the bay? Animal friends abound: At any moment you could see a moose, boar or fox here. Overall they are friendly and used to people in the region’s National Park, however, we don’t recommend taking selfies with wild animals. Okay, but only if you meet a cute, small seal on the beach. Bird lovers should check out the Fringilla ornithological station. The most impressive event here is the International Gliding Club meeting, which occurs every August. In 1924 the East Prussian glider pilot Ferdinand Schulz flew in an aircraft of his own design and set a flight duration world record of 8 hours and 42 minutes. That handmade wooden plane is kept in the local museum, so you can check out this flying vintage glider and many others for yourself. The regional capital Kaliningrad doesn’t possess as much historical architecture as tourists would expect, so that’s why I recommend visiting smaller cities that were not touched by World War II. Chernyakhovsk, known as Insterburg prior to 1946, still guards the ruins of the Teutonic Order Castle. The Knight Call medieval culture festival is held here every summer in August. Old Prussian houses fit perfectly into this ancient landscape, especially the Church of Archangel Michael. This impressive red brick building now belongs to the Russian Orthodox Church. Walk along Pionerskaya and Sadovaya streets and in between and you’ll find a quiet city that is little changed from 100 years ago. Another marvelous town, Svetlogorsk, the former city of Rauschen, is hidden amid the pine trees at the seaside. Even the main road from the center to the residential districts goes through the forest. Ask for directions to the Dom Skazochnika hotel (1 Gofmana pereulok). In the backyard, you’ll find a one-of-a-kind layout of the former city of Konigsberg’s center. Check out the fabulous small houses that populate Svetlogorsk from its cable car. Take a ride to head to the beach or just to admire the views, then have a cup of hot cocoa near the stairs leading to the sundial and take the trail to the park. It leads to the Amber Hall Theater, as well as an unforgettable view from the top of the cliff. Catch the sunset here while sitting on the grass. The gateway to the Mazury Channel is a huge structure made of reinforced concrete five stories tall; it is open to anyone that dares. It was built between 1764-1776 in Ozerki village nine kilometers from the settlement of Zheleznodorozhny. This structure is impressive and extremely photogenic. Go down the stairs and listen to the waterfall right beside you. In the town of Yantarny you will find the widest beach in the Kaliningrad Region. It also is Russia’s only beach that holds a Blue Flag certification, which indicates that it meets strict sustainability standards. You should definitely check out the diving club at the Walter Quarry. If you take the plunge you can see an underwater forest, the former narrow-gauge railway and flooded buildings on the bottom of the former amber quarry. The Kaliningrad Region is also the only place in Russia that features numerous medieval castle ruins. The most famous remains are Balga (about 30 kilometers from Kaliningrad near the settlement of Mamonovo) and Ragnit in the town of Neman.